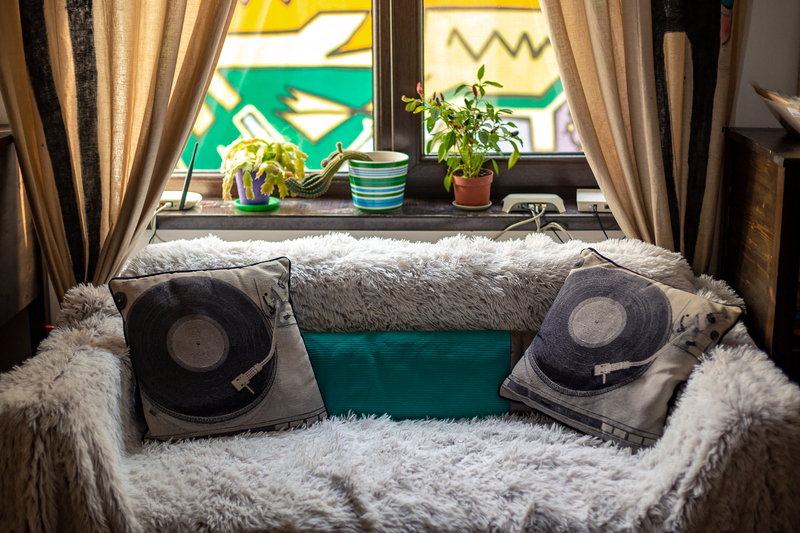 Misbits is a record store in the middle of Bucharest that offers an impeccable selection in a comfortable environment. There are a lot of record stores in Europe, but few have the relaxed appeal Misbits. 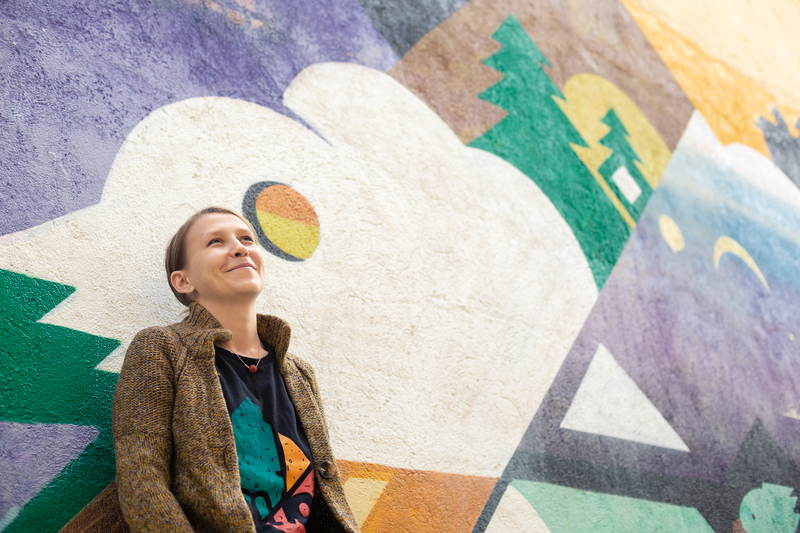 It’s a home in multiple senses of the word, both for the house and techno communities in Bucharest, but also literally, for its owner Iona Parlog (a.k.a. Miss I). We caught up with her to find out more about the importance of maintaining a space like this in a city that’s never had an abundance of quality vinyl record stores. You never know what you might find down a nondescript concrete corridor in Bucharest. It’s a city of many architectural styles where pleasant surprises can hide around seemingly random corners. Turn one way down its Ottoman-influenced street plan, and you might find a building with neo-Romanian or art nouveau design. Turn another way, and you might find a brutalist relic from the communist era. Turn yet another, and you might just as well be invited towards a private residence that’s also one of the country’s most well-regarded vinyl record stores, Iona Parlog’s Misbits Record Shop. Mistbits, which opened in March 2013, sits behind a locked iron gate. You have to ring the bell—equipped with a video camera—to gain entry. 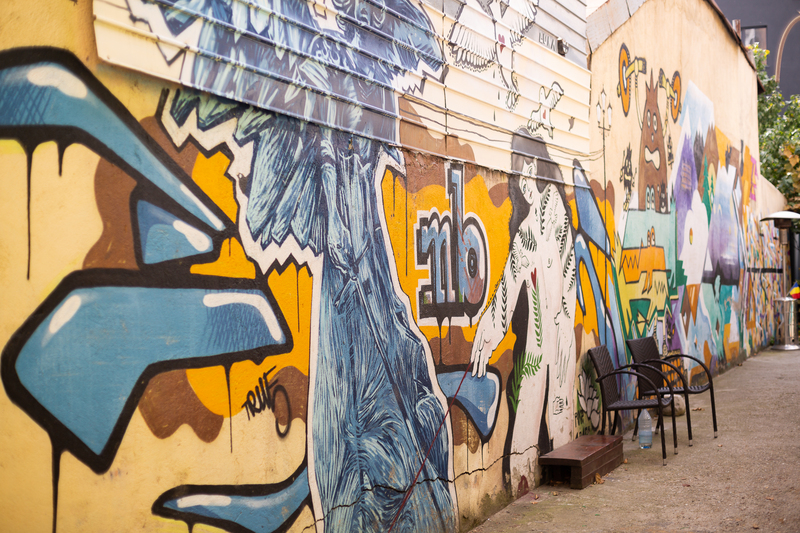 Down a narrow path lined with airbrushed street art and geometric designs lie a few patio chairs and a vintage brass ashtray which identify the entrance. They are reminders of the countless cigarettes Parlog and her customers enjoy outside during the warmer months. It would be fair to say that there aren’t any other record shops like Misbits in Bucharest, but there aren’t many record shops in Bucharest at all. That’s the essential reason that Misbits is such a crucial fixture in the city’s electronic music community. Today, there are still few shops open and none as reliable as Misbits. That’s what initially drew Dragos Ilici to the shop, Parlog’s colleague and former customer. Ilici would move to Copenhagen before returning to Bucharest four years later. Over those years, the shop’s importance to the vinyl community in Bucharest would continue to grow. More economic growth would help balance out the difference in affordability. The price of a record remains largely the same in Romania as it would in Germany, anywhere from 40 to 60 lei, or €8 to €12. But in Germany, where the minimum wage is approximately €1,498 per month, according to Reuters, buying records is easier than in Romania where the minimum wage is less than €408. But despite the inherent challenges involved in running a brick and mortar record shop in the digital age, Parlog has built a reputation for having one of the country’s best stocks and most comfortable lounge spaces. 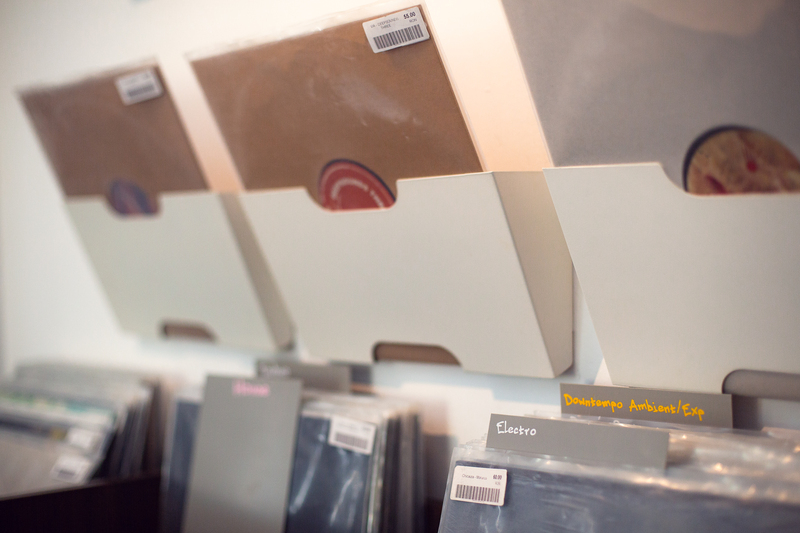 Shelves are labeled with house, techno, minimal, electro and experimental sections. Although the new collection is refined and heavily curated, the second-hand records are worthy of just as much, if not more, attention. Although Parlog underplays the role living at the shop has had on her DJ career, being surrounded by records has certainly not halted her growth. Since learning to mix over a decade ago on a set of turntables owned by a former boyfriend, she’s become a household name at clubs and festivals across Romania. As Miss I, she has a penchant for smooth mixing. Her selection of dubbed-out house, techno and fresh electro cuts has been the talk of festivals like Romania’s 3 Smoked Olives and Waha. But beyond national borders she’s played sets across Europe and the U.S., at clubs like NYC’s Output and London’s Studio 338. You’re unlikely to see the bartenders or Parlog throwing bouquets at the crowd during one of her sets. But there’s a good chance you’ll see a concentrated group of dancers—and a number of hawk-eyed DJs staring at her impeccable mixing. Her desire to break the mold also extends to Romania’s reputation as a place of exclusively minimal and micro-house. It’s a desire she shares with her colleague Ilici, and it’s of endearing value to her customers. That breadth of styles is due to the tastes of Parlog and Ilici. She has been successful so far in choosing her musical collaborators. 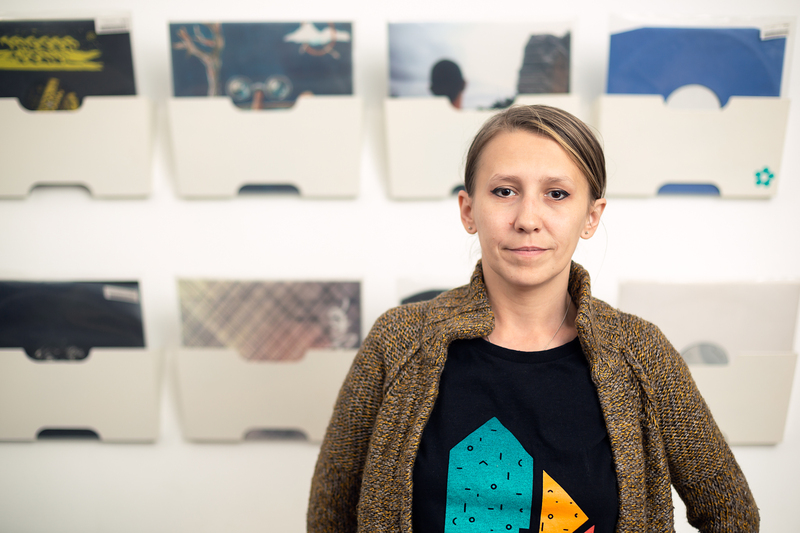 She’s also struck up a fruitful friendship with Cosmin Dumitru, her partner in the shop’s label arm, Misbits Recordings. Focused on beatless experimental music, Misbits Recordings has already released the label’s debut, The Emerald EP. It was launched in 2018 along with an installation series; it featured performances by Misbits artists like Romeo Poirier and Parlog and Dumitru (a.k.a. Smooth Operators). Misbits Recordings has been an intriguing experiment so far for Parlog, but production still takes up a fraction of her time. In between gigs in Tel Aviv and London, she tries to find time to dig abroad with Ilici in hopes of maintaining a fresh stock. Digging trips across Europe, Romanian bureaucracy and a burgeoning DJ career have limited Parlog’s time in the studio. They’ve also kept her away from her former Groove ON radio residency. But she’s remained busy enough to maintain a natural development. Since that point, she’s turned her shop into the sort of communal living room that Bucharest’s DJs so sorely needed. Clubs prove a tying link for musical movements, but there need to be daylight-hours options for discourse and discovery. Through Parlog and Ilici’s buying habits, their helpful dispositions and the shop’s relaxed vibe, they’re bringing the wax-digging community closer together. Daniel Melfi is a contributor to Telekom Electronic Beats. His work has also appeared in Mixmag, Resident Advisor and Format.